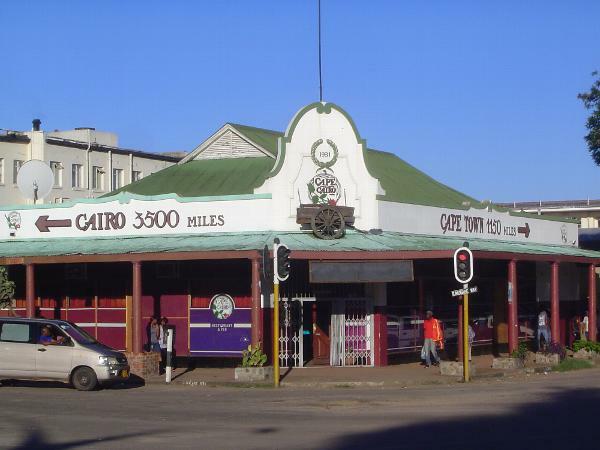 Speaking of Rhodes, here's a pub whose name alludes to his beloved Cape-to-Cairo railroad. It was never built and for lack of economic justification never will be. Meanwhile we have more streets to rename. This corner was once Grey and Selborne. Grey was an early administrator of Rhodesia who went on to much grander things as Governor General of Canada; Selborne succeeded Milner as High Commissioner of South Africa. Now this is the corner of Mugabe and Takawira. Takawira was a teacher turned revolutionary. He died in a Rhodesian prison in 1970. Ask one of the few whites still living in Bulawayo who he was. Answer: "A terrorist." Full stop.